Conflict is almost a given in any relationship and it is important that couples understand this. Fighting here does not refer to physical brawling or scratching each other's eyes out but disagreements / conflicts or views or quarrels. If siblings who were raised by the same parents in the same environment disagree on certain issues, how much more two people from different backgrounds? So basically, disagreements will happen and it should be an avenue to strengthen your relationship and not destroy it. As a matter of fact, the absence of any form of conflict is negative indicator. It’s an indication of pretense or fear or a nonchalant attitude; it could also be an indication of total disengagement. On the contrary, the unending presence of conflict could also be an indication of bitterness and anger. Both cases need to be resolved. Research has shown that how a couple fight in their relationship has a significant impact on the quality and success of that relationship. I do not mean “if” or not they fight or how often they fight but how. 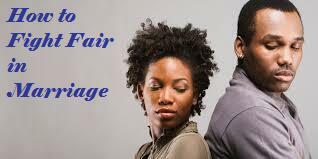 So how can couples fight fair?. These suggestions on fighting helps to preserve the love and value you have for each other during fights. Bad fights have the potential to create deep hurts, resentments and eventually kill the love a couple share. 1. Agree on how to Fight: This best done at a time of peace, during Courtship or during a "State of the Union Session". The terms must be mutually agreed and binding. 2. Set Boundaries on words : Words once spoken cannot be retrieved, agree that verbal abuse is a No-No. Name calling, Cursing, insulting yourselves and family should be banned. No matter the provocation, each party must avoid a war of words. 3. Create trigger words and respect them: Agree on words that one party will say to alert the other party that they are loosing control. You should also agree on how to handle issues when emotions become volatile. Calling for timeouts, shelving the issue till later, sleeping over it are techniques that can be used. 4. Disagree on issues and not with the person: Realize that both of you are disagreeing over an issue and not with the personality of your spouse. Therefore address the issue and not your spouse.This also means you can shelve the issue and move on with you life, all aspects of your relationship shouldn't collapse because you disagree over a little part. 5. Focus on one Issue at a time: Deal with one issue at a time. One of the worst sins of a bad fight is to dredge up other unrelated or past issues. This just confuses issues and creates a worse conflict. Each party should feel free to raise issues with their spouse at anytime but the worst time is to raise a counter issue in response to your spouse's issue. It's a poor way of handling issues. 6. Learn from bad fights: If you ever have a bad fight, when you reconcile take a little while to reflect on how you reflected and learn from it. Do not trade blames. 7. 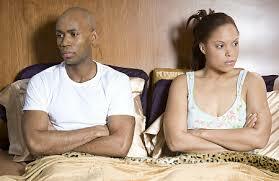 Avoid Generalizing: Words like "You always", or "you never" will definitely trigger your partner's defense. As a matter of fact, it's better to avoid saying "you" but say I. Talk from your perspective rather than accuse. Say "I seem to feel you don't listen to me " rather than saying "You never listen to me"
8. Forget the past: Do not keep a log of wrongs. Once the issue is resolved, forgive and if possible forget. Do not bring it up again. Avoid dredging up past wrongs. Conflict is inevitable in any human relationship, conflict is however not the problem but how it is resolved. Proper resolution of conflicts can lead to better understanding and eventually less conflicts. Improperly resolved conflicts will flare up again and again. Do you have other tips for managing conflicts or a beneficial experience? Do share with us as we love to hear for you. Did you enjoy this post? Please let us know. Also Share it! Who Knows? Someone you know may need it.